Take a look at the TapouT Chael Sonnen UFC 117 Walkout T-Shirt! WAR CHAEL SONNEN (R). Chael Sonnen (R) has nothing to be ashamed about as he is the first ever person to manhandle Anderson Silva in the recently concluded UFC 117, while rocking the TapouT Chael Sonnen UFC 117 Walkout T-Shirt. 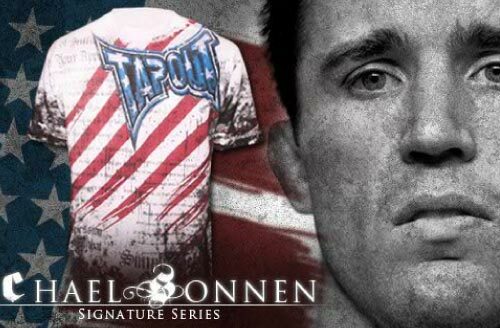 Featuring an American flag design all over with the name Sonnen at the back. And guess what? It’s on pre-order for $27.99 at MMAWarehouse. Ships out at around August 12th, 2010.